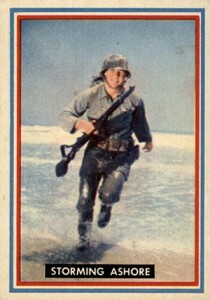 1953 Topps Fighting Marines trading cards are some of the most popular military-themed cards ever produced. Telling the story of the United States Marine Corp, the set has a mix of background, action and battlefield history. Measuring 2 1/16" by 2 15/16", the cards are noticeably smaller than today's standard trading cards. Arranged both vertically and horizontally, some use photos while other cards have detailed paintings. The red, white and blue borders are appropriately patriotic. Card backs offer lengthy write-ups that match up with the front. The top includes a series of headlines noting the caption and subset. The card number is inside a rectangle at the top corner. It also includes a small illustration that highlights the particular subset the card is a part of. Cards came in a couple of different forms. There's the traditional single-card approach. They could also be found in two-card panels. This means that cards can often be found today with the perforation nubs along one side where they were once connected. 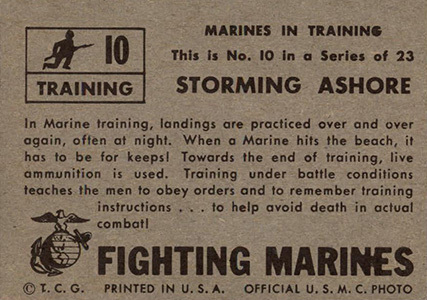 For those not overly concerned with condition, 1953 Topps Fighting Marines is a relatively affordable. Top-condition cards are fairly rare. And while prices for graded copies can get high, they're still a lot less than many other trading card sets from the era. 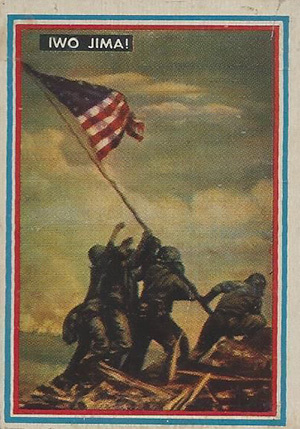 1953 Topps, Fighting Marines, #68 Grenade Attack! 35 "Rush for the Gun"